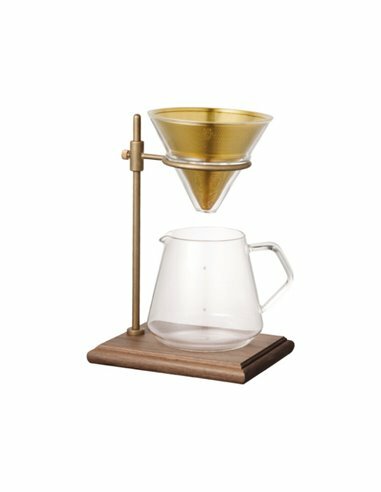 Avoid messy brewing with this stand. The brewer stand set is perfect for those who want to indulge in a deeper, richer coffee time. It comes with a stand, filter, brewer, server, and holder. Brewer stand with a dignified look combines wood in deep colored walnut and brass that will age beautifully. Stainless steel dripper is designed to self-filter, eliminating paper waste. With its adjustable height you can raise or lower the dripper to suit your needs and jug preferences. You can brew full-flavored pour over coffee with this empowering dripper set. This brewer stand is built with polished wood and brass. 4 cup jug collects the falling coffee and makes serving easy and pleasant.